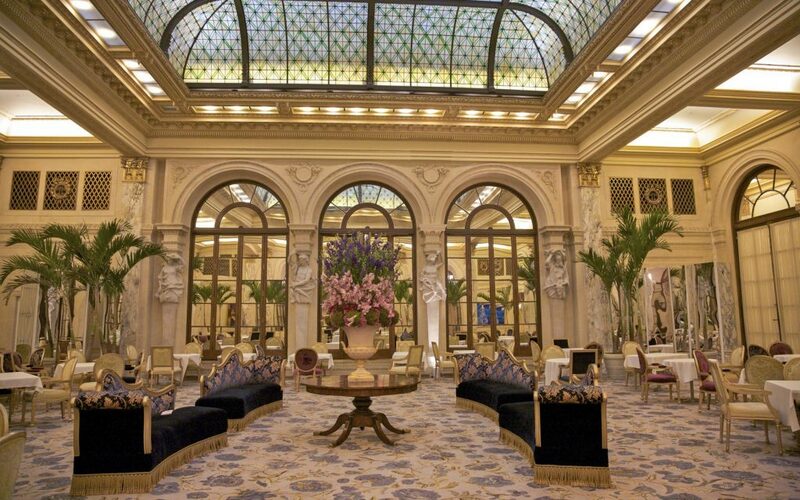 The Plaza hotel in New York was the setting for Kay Thompson's series of Eloise children's books published in the 1950s, about a young girl who lived at the hotel. The hotel was one of the main settings in the series The Princess Diaries by Meg Cabot; it was where Mia's grandmother stayed. 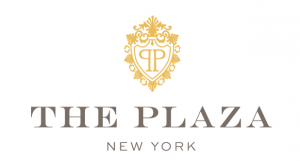 Plus, legendary Hollywood movies like Home Alone have been filmed at the Plaza. What better place to write your story? What would you say if I told you that you could be a best selling author by committing to write for just one day (or just a few hours)? What if I told you there was no tech involved? No worrying about how to format or publish your book? And what if I said you could write in a cool location where other famous authors have staged their books and get creative at The Plaza in New York and Central Park? Optional "Get to Know Each Other" dessert party the Friday night before we start. All tech covered by my team. All you do is turn in your 2500 word story, help create a buzz for the launch and VOILA! Best Seller here you come -- it can't get any easier than this! On November 28, 1966, in honor of the publisher Katharine Graham, the writer Truman Capote hosted his acclaimed "Black and White Ball" in the Grand Ballroom of the Plaza. The internationally known singers Josephine Baker, Eartha Kitt, Liza Minnelli, Marlene Dietrich, Lena Horne, Kay Thompson, Sandler and Young, Ethel Merman, Shirley Bassey, Andy Williams, The Mills Brothers, Patti Page and Peggy Lee played the Persian Room. Miles Davis recorded a live album in the Persian Room in 1958.
going out to ABC, NBC, CBS and FOX. If you're wondering if you can be livestreamed in the answer is YES. Investment in the program is still the same. How can you join an anthology for free? Get a group of your own 10+ friends, everyone gets 10% off and you join for free -- you will all be in your own anthology book, with your own theme, no one else allowed in the book, and you can pick the US city of your choice to hold the weekend. 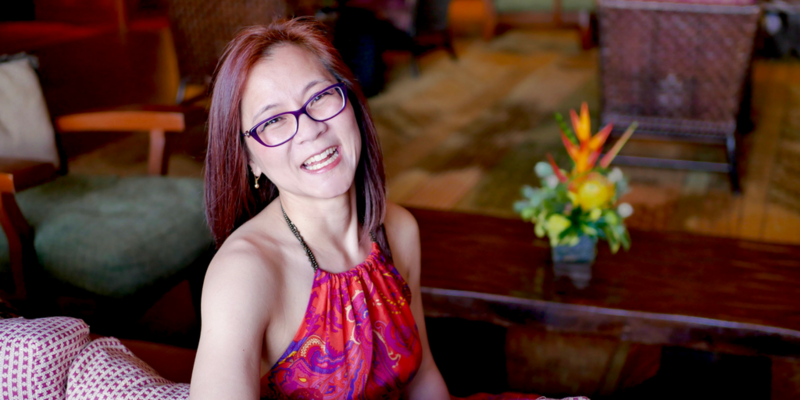 What's it like to be in a Best Selling anthology with Vickie? I had been in an anthology project before and the process had been long, so I was worried. But when I came into this project with Vickie, she literally laid out every single thing you needed to do, with all the dates. Her amazing editor give us feedback so that this project could be the most impactful for our stories and our brand. 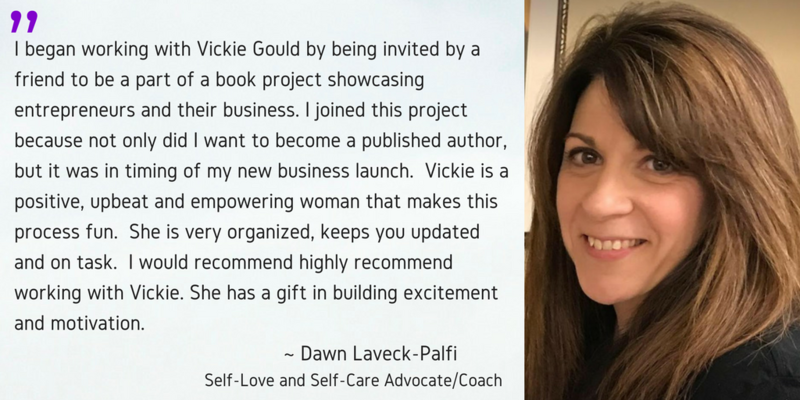 If you want to become a published author and you want someone who makes the process seamless so you can become a Best Seller, I would definitely recommend Vickie. 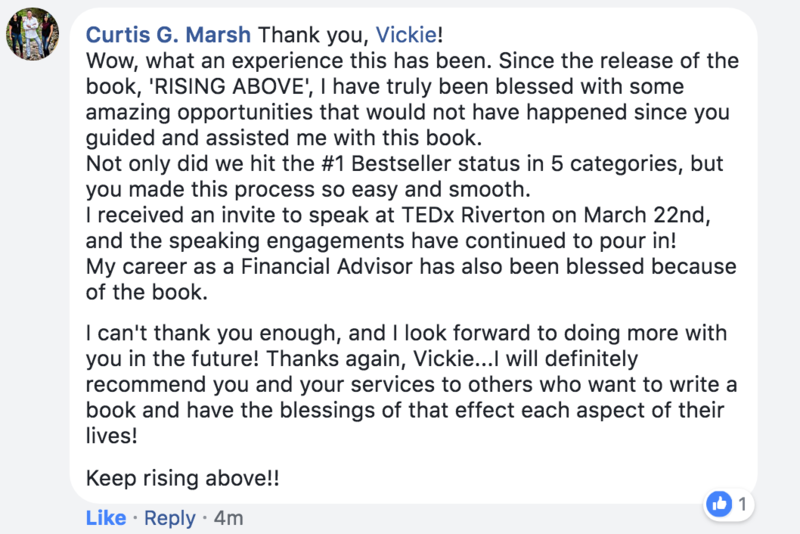 Thank you so much, Vickie, for making this process easy and creating an amazing project that will impact so many lives including the authors in it. I've known I wanted to write a Best Selling book for so long, but year after year, I didn't get it done. When I saw Vickie put out this program, I didn't hesitate. It was an absolute no-brainer. 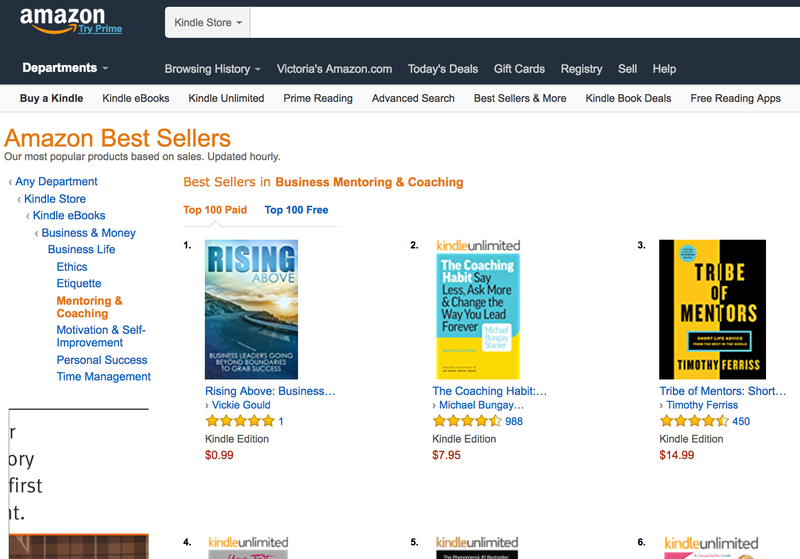 In 3 hours effort on my part, I'm now an International Best Selling author. It was so easy and so much fun. Vickie has an incredible lightness and way of working with you that's such a joy. 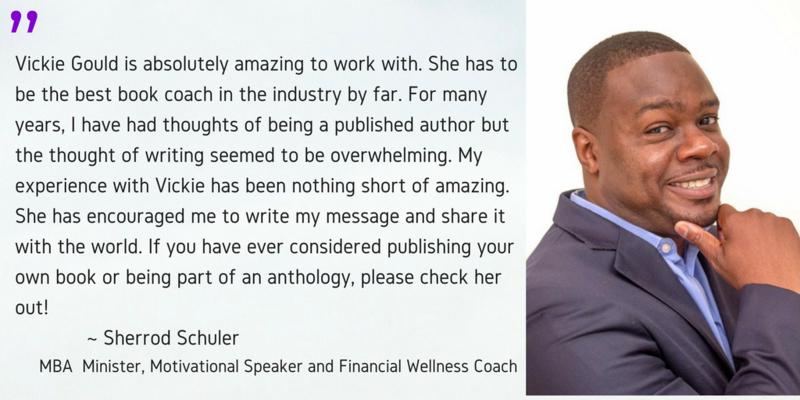 She has an amazing way of calling in incredible people that are not just my co-authors, but now my friends. This is the quickest way to get your message out and so many people who have read the book have told me they've been touched. 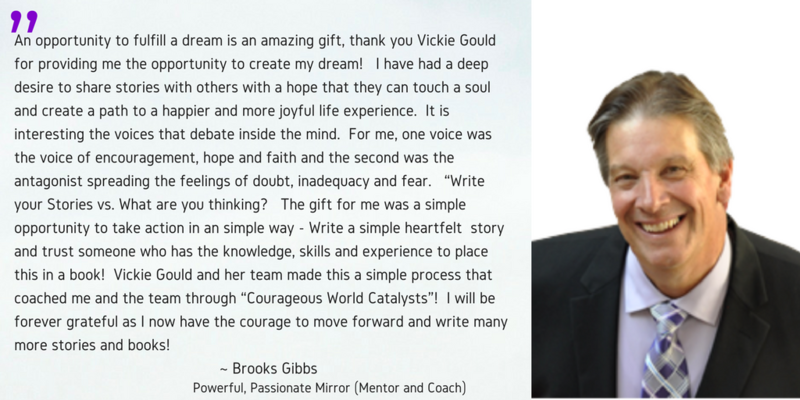 It was an absolutely amazing experience working with Vickie. She attracts the most amazing people! She helped get those stories out of us and onto paper. She also had an amazing editorial team who gave us feedback on making it even more epic. If you're thinking about an anthology, think no more. 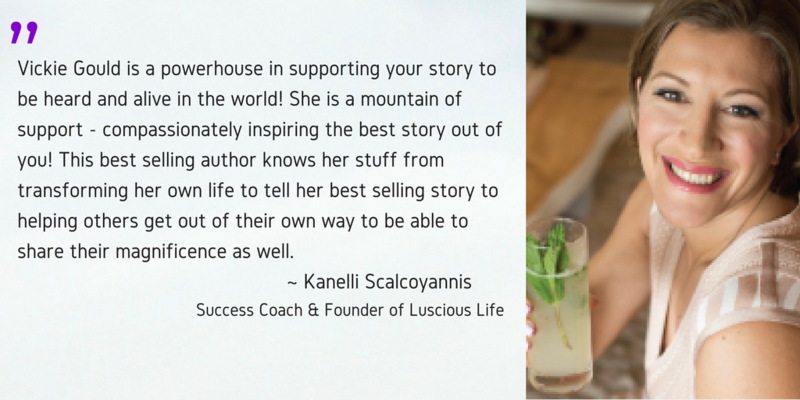 The ability to be a Best Selling author - the credibility, the ability to share your story and impact thousands of people is really going to transform your life. Don't hold yourself back - it was so incredible to go through her program. I have wanted to write a book for a very long time, but I had this idea that writing a book was so hard and so out of reach. When the anthology came up, it was an opportunity for me to go through the process with the support of a community. Vickie was fabulous leading the group to support us. The ability to work with an editor and go through the entire process from writing and editing the story, to getting clear, to the launch - it's all in there. It was just the "right size" for becoming a first time author. 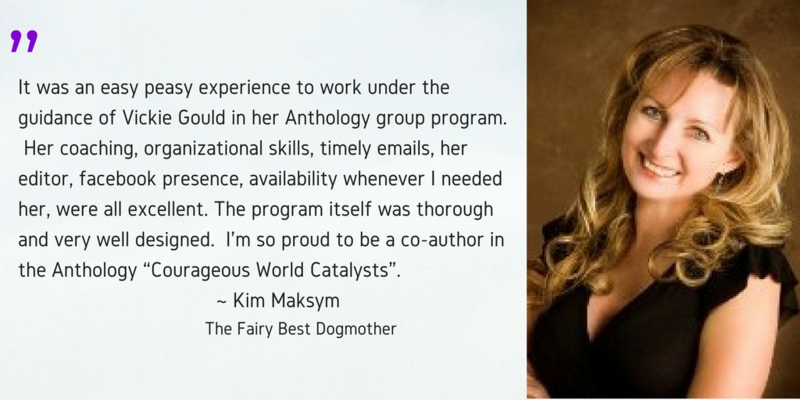 If you have the desire to write a book, if the next anthology is calling to you, I highly encourage you - just say YES! It was such an amazing experience. I could not even begin to say how much it meant to me. 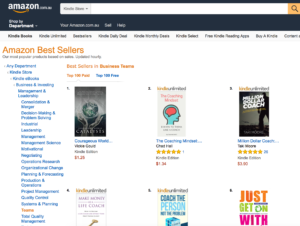 To be a Best Seller is phenomenal and we couldn't have done it without Vickie. If you're thinking about sharing your story or joining Vickie's anthology, please don't hesitate because Vickie is the best mentor. I encourage you - imagine being a part of something as amazing as a Best Selling anthology. Put your heart into it and you'll have the best mentor that could help you with it. You won't be disappointed. Thank you, Vickie. And I’ve had the privilege and honor of having created 10 Best Selling books of my own, including four anthologies. I've been seen on ABC, NBC, CBS, FOX, entrepreneur.com, HuffPost, Thrive Global and more. Even though I love reading and writing, I didn't always know what to put in my books or how to tell my story in a way that I could really make an impact in the world. And I for sure didn't know how to get to Best Seller! All I knew was that I wanted to make that impact, leave a lasting legacy and finally get my message out in a book! I had been wanting to write and share my story for years - probably decades. A lot of times we procrastinate on things that are super important to us because of all the fears and uncertainty around it. How do I write it right? How do I publish it? Will it even make the impact I want? Will it be meaningful? And because of that, we leave the exact thing that we would regret leaving undone at the end of our lives ... undone. Guarantee? How can that be? I get it. I'd wonder too. It seems kind of far-fetched to think someone can guarantee the Amazon Best Seller Status, right? Well, I can't tell you how because that's part of the trade secret in the program, but I can tell you that every client who has completed the process has gotten to Best Seller. Part of it is the number of books you sell and part of it is the secret sauce I'll reveal in the program. 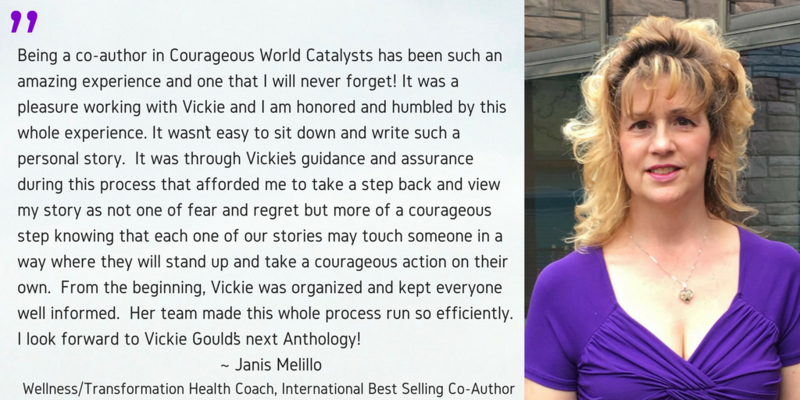 The first Courageous World Catalysts anthology, launched August 8, 2017 and went to #1 INTERNATIONALLY in the USA, Canada and Australia. It also hit #4 in France in Germany and #1 in Hot New Releases in Japan! 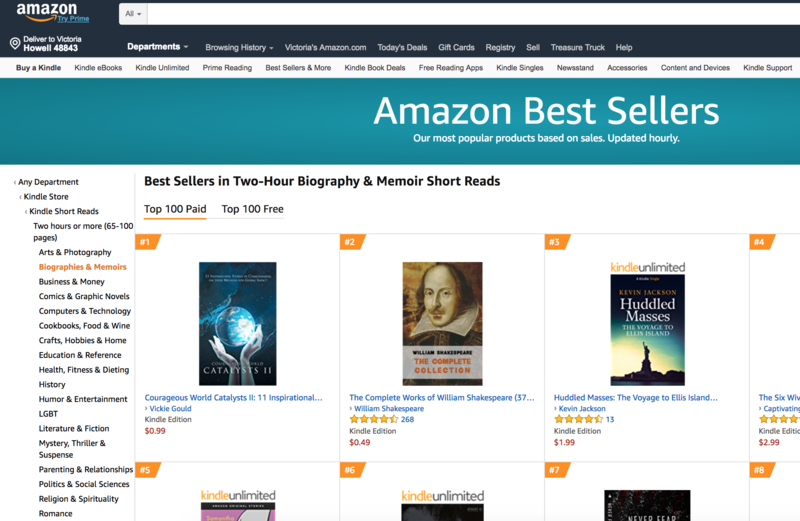 The anthology Rising Above launched Feb 21, 2018 and went to #1 INTERNATIONALLY in the USA, Australia and France. It also hit #2 in Canada and #1 in Hot New Releases in the UK. 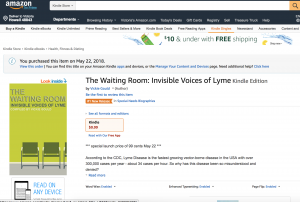 The Waiting Room anthology was my passion project where profits were to be donated to a Lyme movie. 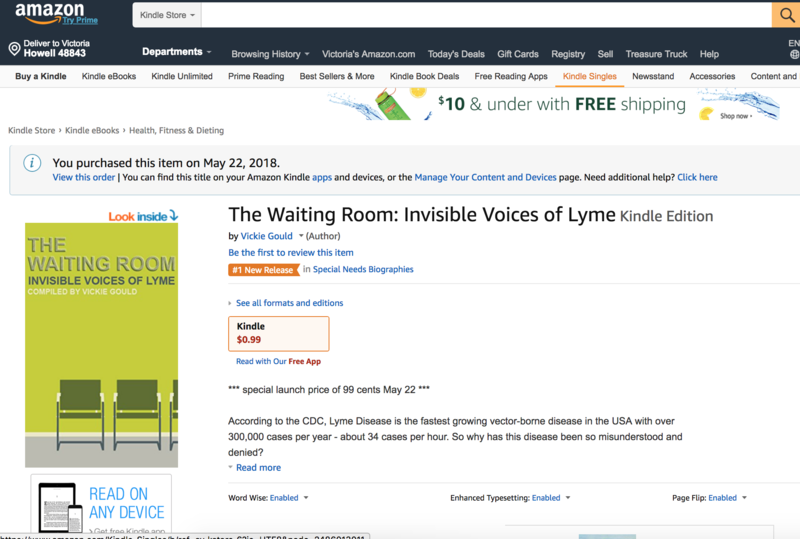 It launched May 22, 2018 and went to #3 in the USA. 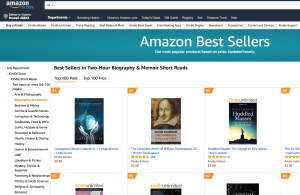 Courageous World Catalysts II anthology, launched September 19, 2018 and went to #1 INTERNATIONALLY in the USA, UK, France and Australia. It also hit #2 in Canada. Click below to claim your spot in the anthology! Disclaimer: This is not for everyone. If you're not the type who likes to work in a group, goes MIA, doesn't like to meet deadlines and has a hard time taking action, then this program is not for you. If you were the kid in the group project at school who let everyone else do all the work, this is not for you. It's important that all participants in the anthology be FULLY COMMITTED to this book. This is a drama-free zone. 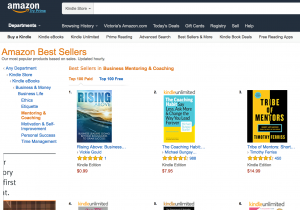 You must be willing to be visible, market and sell 20 copies of the book on launch day. If you're ready to be a published Best Selling author and don't want the overwhelm of doing it all yourself or writing an entire book, this is a great opportunity for you.